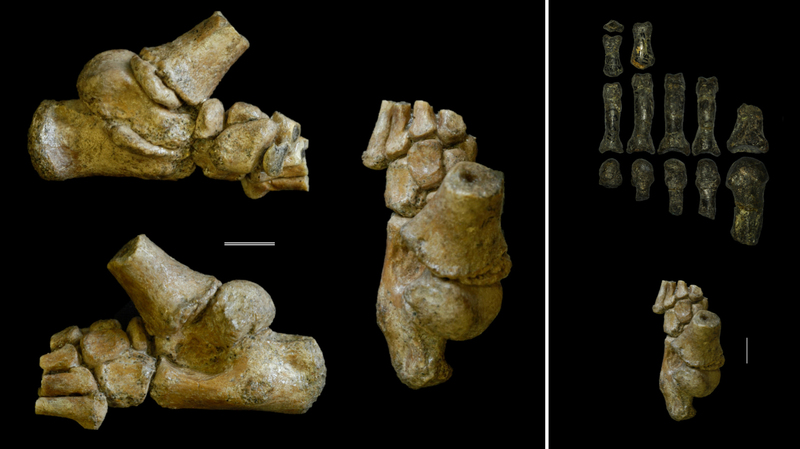 Enlarge / The 3.32 million-year-old foot from an Australopithecus afarensis toddler from different angles on the left, next to the fossil remains of an adult Australopithecus foot on the right. Early hominins’ four smaller toes had adapted to bipedal walking by around 4.4 million years ago, but the big toe remained better-suited to grasping and climbing for a few million more years, until some time early in the evolution of our genus, Homo. That’s the conclusion of a new study by Stony Brook University anthropologist Peter Fernandez and his colleagues, who studied the size and shape of the metatarsals (the bones of the mid-foot) in modern humans, fossil hominins, and an assortment of monkeys and apes. Primate feet evolved mostly to grasp while climbing, which is why chimpanzees have more flexible feet than humans and why their big toes are opposable, like our thumbs. Humans—and our hominin predecessors—are the weird exceptions in the primate family tree, with the basic architecture of our feet adapted to bear weight while walking. Some of those adaptations, like the one Fernandez and his colleagues studied, look pretty subtle to anyone who is not a specialist in primate foot anatomy. Their study focused on how much the head of the metatarsal protrudes toward the top of the foot, sticking out above the shaft of the bone like a dome, at the joint with the phalanx (one of the bones that makes up the toes) at the base of the toe.